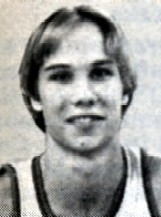 Drafted: Selected by the Los Angeles Lakers in the first round (15th pick overall) of 1977 NBA Draft. I was living next door to Brad his first year in LA..Super nice guy!!!!! Guess I'm the only oldster who remembers how well this cat dished while running the fast break at Maryland. I'm not sure the Terps have had a better PG since then. Part of Lefty's explosive "three-guard offense", he ran the point while fellow Gs Mo Howard and John Lucas filled the lanes. Davis was fast, fearless, and confident, often finishing the break with no-look, behind-the-back, and wraparound passes that brought the crowd out of its seat. Much more talented and effective than his older brother Mickey (ex-Milwaukee Bucks), who deserves credit for letting Brad tag along for schoolyard games in the Pittsburgh and environs in the early 1970s. Looks like the dude picked up a whole lot. A nice baller.